Why? It's the most repeated and consuming question in the face of suffering and tragedy. Why would a tsunami cause such mass destruction and so much loss? Why did those people have to suffer? Why were some saved miraculously while others perished needlessly? Why does cancer strike children or moms in the midst of their busy lives? Why do bad things happen to good people? Or why do good things happen to bad people? We want answers. We want it make sense. We want to find purpose and understanding for that which defies logic and our expectations of a good and loving God. We want to know the why when God no longer feels safe to us. We want to know what is God up to. Listen, I can't even pretend to know the answers. Because I am, like you, the seeker of answers. The questioner. For many things in my own life and for the pain that I see others enduring. I can't even pretend to know what God might be up to, but the one thing I can say is this. While I've said it before, I'll say it again. Because it bears repeated. As I told the grieving birth grandmother after the funeral of her young grandson who died just a few years after being placed for adoption at birth. If God were small enough to understand, then he wouldn't be big enough to worship. I will continue to hang all my fears and confusion and questions on that solid truth that I know to be true. And while I don't have all the answers, I do feel that God revealed some purpose for painful times while I was studying a particular passage of Scripture. Within six months, I first heard a sermon and then a lesson on this passage. I believe that repetition means it bears some contemplation. So, please check out Acts 3:1-10. This is the story of the beggar at the gate called Beautiful. This man was lame and crippled since birth. He was at the mercy of others to carry him daily so that he could seek out enough resources to just get through another day. He's begging for what he needs for that day. For crumbs. And he will get up and do it again tomorrow. Because that is the rhythm of his life. Get up. And get by. Begging. For just enough. I just wonder. Can you relate? Is this how you live your days? All too often, I wake up tired. Pressing through. With just enough for the day. Eager to collapse at bedtime so that I can get up and do it all again. All the while wondering when the abundant life comes and the thriving because I'm sorta just phoning it in, robotic in my efforts and numb to motivation and drive. Because the mundane has taken over any sense of hoping for more. These are the seasons or days when we are so distracted with the seen that our focus is concentrated on the tasks of the day and the demands of the day and the basic needs to just get for by this day. All too often, we all tend to act like the beggar. Desperate for just enough. Not even able to consider anything more. But, here's the revolutionary truth. Here's the unseen we should focus our eyes upon (2 Corinthians 4:18). What is not revealed is what God is going to do. 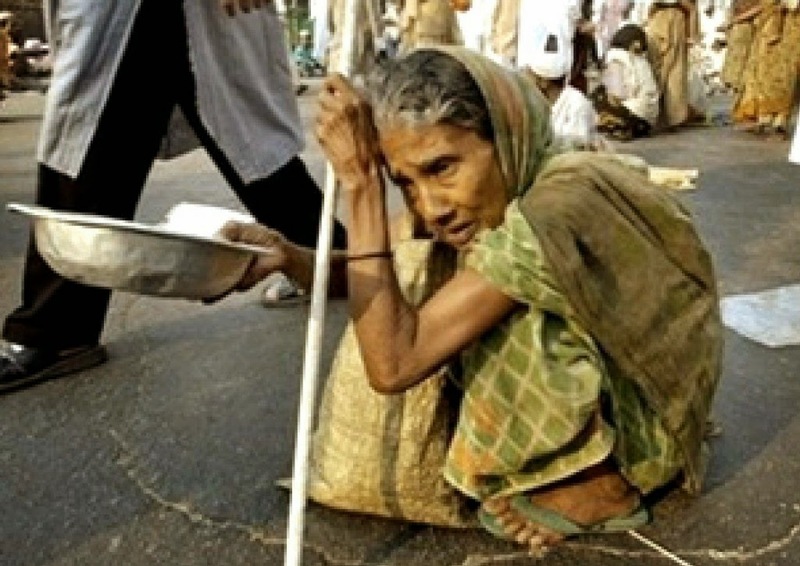 The truth of this beggar's particular routine day is that God was about to usher in a wholeness like he had never known. In our lives, we sit broken at the gate Beautiful, begging for crumbs. Begging for what we need for this day alone. And all the while, behind the veil of the unseen, God is working toward an eternal change. A big picture, game changer, ever lasting difference in our lives. This beggar was begging for crumbs. But God was setting a banquet table of GRACE for him to feast on, for an everlasting healing. We tend to beg for the needs of this day, just getting by. Blinded to the truth that in whatever reality we can see today, our God is working out an eternal plan for wholeness and healing. He is setting places at a feast. That is far and beyond what we can imagine. A day is coming when there will be no more hunger. No more death by starvation. No more brokenness. No more begging. Jesus didn't die on that cross so that we could beg God for crumbs. He spilled his blood so that we can feast on a banquet of grace, gorging on the depths of his love from this day forward. No matter our temporary struggles or pains or circumstances. No matter how long we've woken up and been carried to a position of begging. It's just temporary. We, in the church, tend to beg for the crumbs of ritual and tradition and legalism and consumerism faith and performance based love. Begging for the approval of others and the riches of this world and a trouble free life. While God has set a banquet table of grace and love and living freely on the unforced rhythms of grace. How ludicrous that we would waste our earthly days just getting by! And in seasons of suffering--beyond the madness of the mundane--we ask for the needs of the day. We beg for the crumbs of the temporary and the here and now. While God is accomplishing a much bigger picture. That far exceeds our wildest imaginations. The unseen that surpasses the wishes and hopes for which we beg. God wants us to live out Matthew 11:28-30 while we go around dragging the weight of our burdens and pleading and begging for the crumbs of the day. He asks us to remember that he has a much bigger picture. A kingdom purpose. An eternal glory. That we could see our circumstances through the lens of that hope. God asks us to look to him and expect from him. To be still and know. In Acts 3:5, the beggar gave the disciples his attention, expecting something from them. God is continually moving within us, calling us to Sabbath living, to find rest for our souls in his capable arms. He calls us to learn the sacred practice of sitting at the feet of Jesus. So that he can do more than we ask for imagine (Ephesians 3:20-21). He didn't call us to sit at his feet and just beg. He called us there to commune with him. To experience him. So, do you expect to get something from God? Namely--God himself. Do you give him your full attention as you beg for what you need? Just what are your expectations of God in your seasons of hardship? What is he up to during these trials? In John 11:44, we see Martha and Mary and God moving in the midst of a grief that brought even Jesus to tears. Here's what God is up to. God is using our brokenness and our dead things to do new things. To bring wholeness and healing and to bring about new works. Sometimes in this world. Like the beggar's outcome. As he did for Lazarus, raising him from the dead. And sometimes, the wholeness and healing are done in eternity. Like when my dad was healed from his terminal cancer. Made whole, with his gaunt frame and weak body completely renewed. As he stepped into the arms of Jesus and met his Savior face to face. My dad's new thing came when he entered the unseen. Even there--left behind--new things were coming for me, too. While I grieved. When I suffered a miscarriage, new things were being born within me. When we lost our newborn nephew, God was orchestrating new things within us all as we grieved. If you have ever had the privilege of standing by the bedside of a believer as they enter glory, then perhaps you can understand when I say that there is nothing so profound as when heaven meets earth. When God reaches in and ushers in an eternal healing. It's bittersweet and brutiful and a work of God like no other. Because the magnitude of the unseen is just nearly tasted and experienced when the veil is lifted and Jesus welcomes his children home. No matter our suffering or loss, I believe he wants us to obey the command he offered for Lazarus, as he walked out of the tomb. He wants us to take off our grave clothes. To remove them while he calls us to move forward and weep and mourn forward. To not stay bound up or defined by the trials we've survived. Because he is doing a new thing. With the beggar, God did a new thing. He healed his body and changed his life, as well as his eternity. With Lazarus, God did a new thing. He brought the dead to life. For Mary and Martha, God did a new thing. And for the record, I actually think that seeing Jesus weep in their sorrow demands our attention as much as the fact that even death cannot usurp God's power. Because just as Jesus knew the coming resurrection of Lazarus, he was moved by the sisters' pain. And just as he knows the eternal purposes of our suffering -- he still weeps with us. In the seasons of suffering, when God weeps with us and shows us compassion as we give him our attention and expect him to show up...there a marvel occurs. There -- Jesus' name is exclaimed. Bringing light to the darkness. The name of the Savior that changed the game by offering an eternity with him and paying the ultimate price for us. The name of grace by which all can be saved. And all can find a place at the never ending banquet of the Lamb. His name is exclaimed when we turn to him in our brokenness and expect him. Then, we can walk and jump and praise God, just as the beggar did after he was healed (Acts 3:8-10). Psalm 46:10 tells us to be still and know that he is God. In our bounty and want. So that his name is exclaimed. In those moments of trials and suffering and weeping...God is showing up. He meets us at the Gate Beautiful when we are broken and lame and crippled. And he wants us to respond to his presence...in our weeping. In the new thing being done and the life that comes from death and the big picture of the banquet of God's grace. He wants us to respond to him just as the beggar responded to the disciples. We see in Acts 3:11 that he clung to the disciples who brought healing. God calls us to cling to our Healer. To let him weep with us. And through it all, the ugly at the Gate Beautiful can lead to God being exalted. Oh yes. God's heart beat is to bring new things from the dead things and the broken things. New things that we cannot even fathom. New things that bring purpose from the pain. New things that cause us to praise and exclaim his name. You see, this story of the beggar at the Gate Beautiful -- it was the catalyst for the launching of the first church. The attention and questions by others about this healed beggar led to Peter's great teaching and the new works of God being unleashed. No tear is wasted. They fall on hard ground to water the seed that has died. Where new things will bloom. No suffering is in vain. ...throw yourself at his feet and weep. And let him weep with you. Remembering that he knows the big picture and he will sustain you for the new things that will come. As the beggar went from just getting by to being changed forever. And the day will come when we shall feast for eternity, welcomed to the banquet of Christ for his church. And we will hunger and want no more. Blog post #12 in a series: Sabbath Living: Sitting at the Feet of Jesus.